Howard "Howie" Rose (born February 13, 1954) is an American sportscaster. He is currently a radio broadcaster for the New York Mets on WOR and formerly also called games for the New York Rangers and New York Islanders. Rose was born in Brooklyn into a Jewish family. He attended PS 205Q (The Alexander Graham Bell School), Benjamin N. Cardozo High School in Bayside, Queens and graduated from Queens College in 1977. He lives on Long Island in Woodbury, New York with his wife and two daughters. His oldest daughter Alyssa was an actress who has appeared on the soap opera One Life to Live. She currently has a podcast called Scoring Position. Rose started his career doing sports updates on New York City based SportsPhone, a telephone dial-in service, during the mid-1970s, which led to sports updates on news radio station WCBS-AM through the early 1980s. Rose has called Mets play-by-play on radio or television since 1995, and is regarded by fans and media outlets alike as an expert of Mets history. He has previously hosted the "Mets Extra" pre- and post-game shows. He worked the television booth until the retirement of long-time Mets radio voice Bob Murphy in 2003. The following year, Rose took Murphy's spot alongside Gary Cohen on WFAN. Cohen became the play-by-play broadcaster on new Mets television network SportsNet New York starting during the 2006 season, sharing the radio booth with partner Tom McCarthy. In 2008, Wayne Hagin replaced McCarthy, and since 2012, Rose has called games with Josh Lewin. Starting in 2014, he has called games on WOR. He has also co-hosted MLB Now, joining Brian Kenny, Mark DeRosa and Ken Rosenthal on MLB Network. Rose has also been the master of the ceremonies during key Mets events, including Opening Day at Shea Stadium and Citi Field since 2004. He has hosted ceremonies marking the opening of Citi Field in 2009, the 40th anniversary of the Mets 1969 World Series victory, a special pregame ceremony honoring Ralph Kiner in 2008, and Mike Piazza's number retirement ceremony in 2016. Rose's end-of-game catchphrase is, "Put it in the books", used after the final out is recorded in a Mets win. After Mets losses, Rose says "and the ballgame is over". When he uses the phrasing "and the Mets are leading by a score of _ to _", he is using the same diction as original Mets broadcaster Lindsey Nelson. Rose worked as a play-by-play radio announcer for the New York Rangers, and was paired mainly with Sal Messina. He is most recognized by Rangers fans for his call of "Matteau! Matteau! Matteau!" made when Stéphane Matteau scored the game-winning goal in double-overtime of Game 7 of the 1994 NHL Eastern Conference Finals against the New Jersey Devils. Rose was the play-by-play announcer for Islanders telecasts where he works alongside Butch Goring. For the 2009–10 season, Rose's work was simulcast on radio as well. Rose replaced Jiggs McDonald on Islanders broadcasts in 1995–96 and was previously partnered with Ed Westfall, Joe Micheletti, and Billy Jaffe. After the 2015-2016 season, Rose announced he would not return to call Islanders games after the end of the season. Rose was the original prime-time radio host on WFAN when the station went all-sports in 1987, hosting the program until 1995. Rose occasionally worked games for Fox NHL Saturday in the mid-1990s, and now works for Fox Saturday Baseball. He has also called Long Island Blackbirds basketball and soccer. On March 1, 2013, his book Put it in the Book was released. The book is an autobiography and memoir of 50 years of Mets history. The book was co-written with Phil Pepe. In 2012, Rose was inducted into the National Jewish Sports Hall of Fame. He has won two Emmy awards for excellence in broadcasting for the New York Islanders. 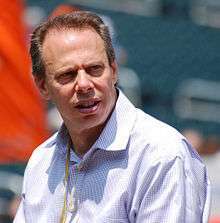 ↑ "Howie Rose". MSG Network. Retrieved September 20, 2007. ↑ "Howie Rose, Islanders Play-By-Play Announcer". MSG.com. Retrieved August 1, 2015. ↑ Best, Neil. "Howie Rose, Islanders' TV play-by-play man, won't return next season". Newsday.